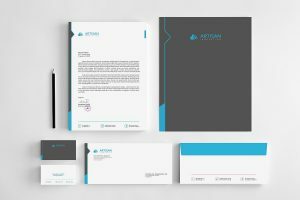 In its simplest form a company’s Corporate Identity is the elemental look of the company brand and can generally be found is a suite of documents such as the company logo, business card, letterhead, envelope, and website design. A Corporate Identity is what makes up the physical look of your brand. It usually includes your logo and the supporting devices such as your website, letterhead and business card as well as your social media platforms and the ‘tone of voice’ of your business. A corporate identity or corporate image is the manner which a corporation, firm or business presents themselves to the public, such as customers and investors as well as employees. It is a primary task of the corporate communications department to maintain and build this identity to accord with and facilitate business objectives. It is typically visually manifested by way of branding and the use of trademarks. But also includes things like product design, advertising, public relations and the like. I am ex-architectural woodworker and general contractor turned IT, Business and Project Management consultant, software developer wannabe senior division triathlete and ski racer, Yankee fan and founder of Paradigm-360.com, 360 Difference Mac4Construction.com,iOS4Construction.com and now TheBuildingAndRemodelingWiki.com too.